Spanish seaman José María Narváez (1768-1840) was an explorer and cartographer, whose major contributions to Mexican cartography in the first half of the eighteenth century have been largely forgotten. Narváez did not even give his name to what ranks as probably his greatest “discovery” – the stretch of water on the west coast of Canada now known as the Georgia Strait, on the eastern shore of which is the major city of Vancouver. While Captain George Vancouver is usually given the credit for exploring the Georgia Strait and discovering the site of the city that now bears his name, it was actually José María Narváez y Gervete who was the first European to sail and chart those waters, in 1791, a full year before Capt. Vancouver. Born in 1768, probably in Cadiz, Narváez entered the Spanish Naval Academy in April 1782 at the tender age of 14, and soon saw his first combat at sea. In 1784, he sailed west, visiting various places in the Caribbean, as well as New Spain. In February 1788, he arrived to take up an assignment at the naval station in the busy Pacific coast port of San Blas. For the next seven years, he explored the coast to the north, including the Strait of Georgia, which today separates Vancouver Island from the city of Vancouver. He also sailed to Manila, in the Philippines, Macao and Japan. In the summer of 1791 Narváez, on the orders of Captain Alejandro Malaspina, sailed his sloop, which was less than forty feet long, into the strait of Georgia (then more grandly known as El Grand Canal de Nuestra Señora del Rosario la Marinera! ), and continued past the mudflats at the mouth of the River Fraser as far north as Texada and Ballenas islands, before turning back to reprovision his vessel. Like any good cartographer, he charted his route meticulously as he went. The following year, Captain George Vancouver was understandably distressed when he was shown the Narváez chart and realized that the Spaniards had gained a clear lead in the race to map the coastline, and might beat the English in finding the Anian Straits. In the event, neither side won, since the Straits proved to be a figment of the imagination of earlier sailors. Narváez returned to his base in San Blas, Mexico. On October 23, 1796, he married María Leonarda Aleja Maldonado in her hometown of Tepic. The couple raised six sons and a daughter. One of his direct descendants, a great-great-great grandson, José López de Portillo, was President of Mexico from 1976 to 1782. After 1797, Narváez busied himself mapping different parts of Mexico’s west coast. In 1808, he surveyed the route for a new road between San Blas and Tepic. In November, 1810, at the start of the War of Independence, Narváez found himself unable to prevent San Blas from falling to the insurgents. His superiors tried to court-martial him for failure to defend the port, but Narváez successfully argued that the real cause had been a lack of firepower, since his men had only 110 rifles and shotguns at their disposal. On his return, Narváez was summoned to Lake Chapala, where a group of determined insurgents had installed themselves on the island of Mezcala and were refusing to surrender. General de la Cruz requested help from the Spanish Navy, and Narváez duly obliged. The Royalist troops and the rebels agreed an honorable truce in November 1816, by which time Narváez had begun his map of the lake. He completed the map the following year, and several years later had produced a truly fine map of the entire province of Jalisco, a scaled down version of which, with updated boundaries, became the first official map of the state in 1842. Narváez’s map of Lake Chapala was the earliest scientific map of the lake, and was adapted, with only minor modifications, by many later publications. The map shows the lake to have a maximum depth of 13.86 meters (45 feet) just south of Mezcala Island. Most of the central part of the lake is shown as having a depth of about 12 meters (39 feet). These depths are rainy season values; the dry season depths would probably be about one and a half meters (five feet) shallower. Following Mexico’s Independence in 1821, Narváez decided to remain in Guadalajara with his family, though his official discharge from the Spanish navy was not granted until May 25, 1825. By that time, he had been appointed Commandant of the Department of San Blas, and had been searching for an alternative location for a major port, since San Blas “has the great defect of not being more than an estuary, incapable of receiving boats that draw more than twelve feet”. Narváez, the long-overlooked sailor and cartographer, went on to draw many more maps, before he died in Guadalajara, at the age of 72, on August 4, 1840. His numerous contributions to the accurate mapping of both Mexico and Canada have received surprisingly little recognition, except for a small island named after him off the west coast of British Columbia, and the name Narváez Bay for a gorgeous little bay on Saturna Island (a contraction of Saturnina, the name of his vessel), in the Gulf Islands National Park. McDowell, Jim. (1998) José Narváez. The Forgotten Explorer. Including his Narrative of a Voyage on the Northwest Coast in 1788. Spokane Washington: The Arthur H. Clark Company. 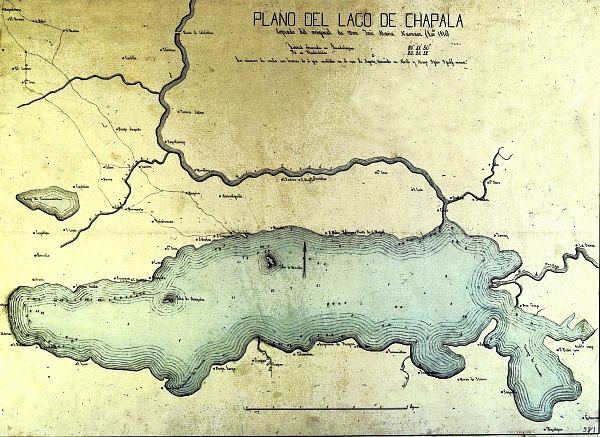 Narváez, José María (1816-17) Plano del lago de Chapala. Guadalajara de la Nueva Galicia. Narváez, José María (1840) Plano del Estado de Jalisco. Guadalajara. This article was originally published as “Did you know? 19th century Mexico map maker first sailor through the Georgia Strait, Canada” Mexconnect.com (2008). For more about Narváez’s mapping of Lake Chapala, see chapter 14 of Lake Chapala Through the Ages; an anthology of travellers’ tales. For more about the fighting on the Island of Mezcala during the War of Independence, see chapter 2 of Western Mexico, A Traveler’s Treasury (4th edition, 2013) and for more about the port of San Blas, see chapter 25 of that book.